SCOTT LANG MUST PICK UP WHERE HANK PYM LEFT OFF! 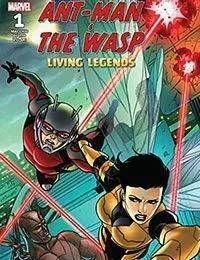 When the leader of an interdimensional force is captured by a brutal dictator, they reach out to their old friends ANT-MAN &amp; THE WASP! But…uh...you see, SCOTT LANG is not exactly the Ant-Man who helped them all those years ago…he's AN Ant-Man, but not THAT Ant-Man…but when the fate of freedom hangs in the balance, Scott Lang has no choice but to try and fill the shoes of his mentor, Hank Pym, as Ant-Man and the Wasp fly once again! Written and drawn by comics legends RALPH MACCHIO and ANDREA DI VITO, you won't want to miss the epic intergalactic conflict…or the return of the LIVING ERASER!